Decembder 13 is National Day of the Horse. Remind our federal legislators that we WILL NOT FORGET the Sheldon wild horses. Please urge your Senators to demand that the FWS confirm the well-being and location of every single horse shipped to Stan Palmer, and to ensure that no Sheldon horses are ever again shipped to this known slaughter middleman. Since 2010, the the U.S. 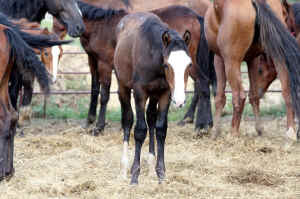 Fish and Wildlife Service, which operates the Sheldon Refuge, has captured and dumped hundreds of Sheldon horses on a slaughter middleman in Mississippi. Worse, the government has paid the middleman - Stan Palmer of Pelahatchie, MS - nearly $1 million to dispose of these horses. Just this fall, 238 Sheldon horses were sent to Palmer, where they have been observed leaving his property by the truckload. It is believed that many of these horses are headed for slaughter. On December 13, the National Day of the Horse, please help us stop this ludicrous waste of money and inhumane treatment of our nation’s wild horses. Tomorrow, December 13, is the national Day of the Horse. It was declared by Congress to remind citizens "of the contribution of horses to the economy, history and character of the United States." To mark this day, please take a moment to speak up for some very special wild horses who have been forsaken by the federal government. The wild horses of the Sheldon Wildlife National Refuge have ranged on the lands in northwestern Nevada since the mid- to late-1800s. Their ancestors were America's War Horses, used as cavalry remounts in battles through WWI. Yet the refuge seeks to eliminate these historic animals from the refuge over the next two years. In September, the government rounded up 415 of the estimated 800 remaining Sheldon mustangs. Despite public outcry, over 230 were sent to slaughter-middleman Stan Palmer in Mississippi. As the Sheldon horses arrived in Mississippi, a Palmer employee urged people on Facebook to "show up with your trailer and load em up….need gone asap!!!!" Shortly thereafter, the horses began leaving Palmer's property by the truckload to destinations unknown. Thanks to an outpouring of concern by AWHPC supporters, members of Congress have begun to question the FWS about the Sheldon horses. Last month, the FWS held a special briefing for Congressional staff on the issue. A week later, the FWS was scheduled to travel to Mississippi to confirm the well being and location of the horses sent to Palmer. As of today, we have heard nothing of the results of this inspection. This is unacceptable.